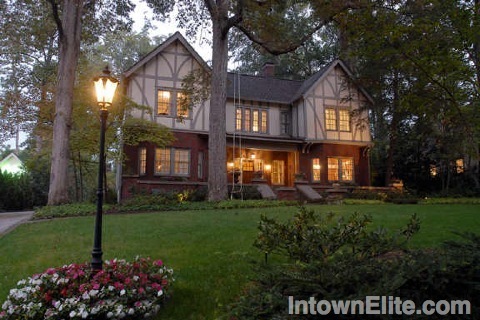 The Druid Hills Historic District, including the Druid Hills Parks and Parkways Historic District, were designed beginning in 1893 by Frederick Law Olmsted on land assembled by Joel Hurt. Olmsted's influence can be seen in other areas of town. In fact, Designers who worked on the Druid Hills development later designed the Intown Atlanta neighborhoods of Ansley Park and Morningside. Elements of its design were also echoed in the Buckhead neighborhoods of Brookwood Hills, Garden Hills and West Paces Ferry. The district includes a wide variety of architectural styles, with the Tudor, Georgian, Jacobean, and Italian Renaissance being the most common. Period homes in the neighborhood range from mansions to bungalows.